> Sage > I'm in the Cloud - Now What? 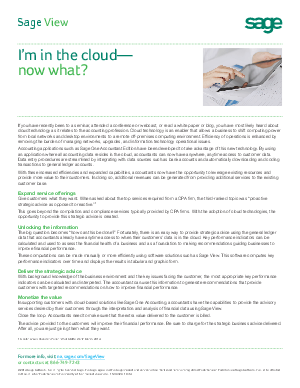 I'm in the Cloud - Now What? If you have recently been to a seminar, attended a conference or webcast, or read a white paper or blog, you have most likely heard about cloud technology as it relates to the accounting profession. Cloud technology is an enabler that allows a business to shift computing power from local networks and desktop environments to a remote off-premises computing environment. Efficiency of operations is enhanced by removing the burden of managing networks, upgrades, and information technology operational issues.